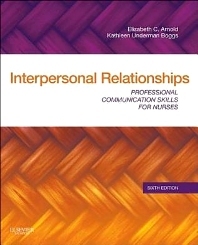 Acclaimed for its strong theoretical framework and consistent organization, Arnold and Boggs' Interpersonal Relationships: Professional Communication Skills for Nurses, 6th Edition, remains the definitive resource in developing effective communication with clients, families, and colleagues in order to achieve treatment goals in health care. This two-time AJN Book of the Year award-winner is thoroughly updated and includes current references describing how to modify communications strategies for various populations and situations including children, the elderly, end of life, health teaching, stress, crisis, and colleagues. Two new chapters address issues in contemporary health care related to promoting health safety and supporting continuity of care. Not only does this book present proven communications strategies and principles in nursing, psychology, and related theoretical frameworks, but also it challenges you to apply these strategies and principles to numerous exercises and practical nursing case studies. Written in terms of the nurse-client relationship, the cutting-edge communications strategies presented are key for nursing students and professional nurses. Discusses nursing, behavioral, developmental, family, and communication theories, providing an essential foundation and a theoretical perspective of effective communication. Offers basic concepts first, followed by applications with emphasis on assessment, providing a sound framework as you prepare for nurse-client interactions. Experiential exercises offer the opportunity to practice, observe and critically evaluate your professional communication skills in a safe learning environment. Critical Thinking Exercises promote critical thinking processes essential for effective communication in nursing practice. Includes case examples throughout, creating empathy for clients' perspectives and needs. Offers Ethical Dilemma and Developing an Evidence-Based Practice boxes in each chapter. Describes how best to use the electronic health record for clear communication with current information on classification systems, standards of documentation, and telehealth technologies used in nursing. Acknowledges humor, gender, and touch as important means of communication in interpersonal relationships. Increases awareness of the issues involved in communicating with individuals of various stages of life, clients with special needs, and colleagues in all areas of health care. Provides learning objectives, chapter overviews, and a detailed glossary -- all designed to focus your learning and help you organize key content. 22. Communicating for a Safe Environment NEW! 24. Communicating for Continuity of Care NEW!